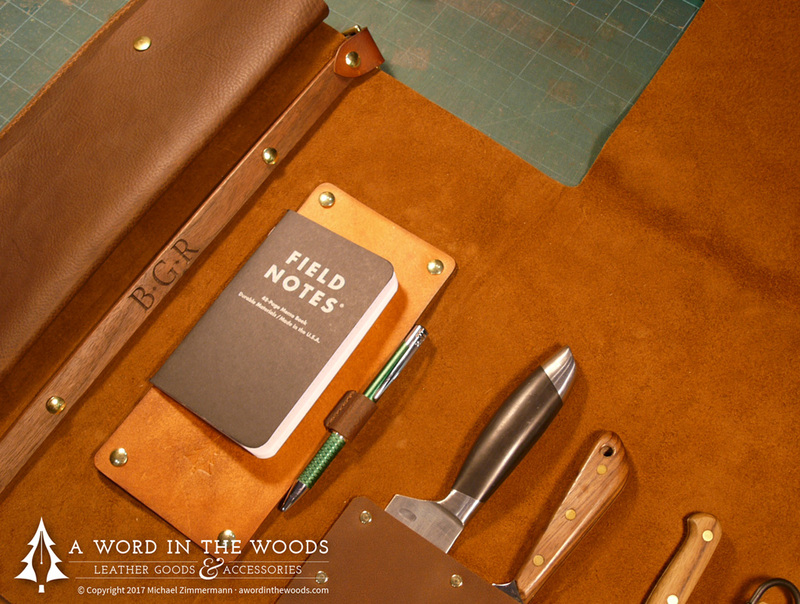 This is the first entry in a 3-part series about the planning and construction of a custom leather chef’s knife roll. To view just the photos, visit the gallery on Facebook. When it comes to making things by hand, there are always challenges, risks, and rewards. It can be stressful, but in the end, there’s no better way to learn than to embrace both the possibility of failure and the joy of accomplishment. A chef’s knife roll might seem like a straightforward design, but sometimes, elegant simplicity is one of the hardest things to achieve. Most custom work that I tackle goes through a few rough prototypes, but the sheer expense of materials in this case meant that I had to really keep the ‘measure twice, cut once’ mentality front and centre in my mind at all times. Everything from slot sizes to the exact thickness and length of the straps was unique in this project. I used to be a graphic designer and developer, and like many projects in the design and agency world, it all starts with a creative brief to outline the expectations, options, goals, and timelines. I met with my customer, a wonderful young woman who wanted to present her fiancé with a special gift to suit his passion and profession—a custom knife roll. We discussed options over coffee and tea, and I brought some material swatches to recommend a look and feel. We had already traded emails of potential design ideas, but this in-person meeting was a way to make sure that she was happy and confident that I had a good grasp of what she had in mind. Great customers don’t micromanage. They are up front with what they need, and then trust you to do your thing. This was a great customer. I had my list of solid requirements, soft ‘nice-to-haves’ and the rest was up to me. There are many types of knife rolls out there, from cheap canvas that are little better than throwing your tools in a shopping bag, to briefcase-style behemoths, and endless variations in between. I felt it would be a good idea to sit down with someone who puts a roll through its paces. 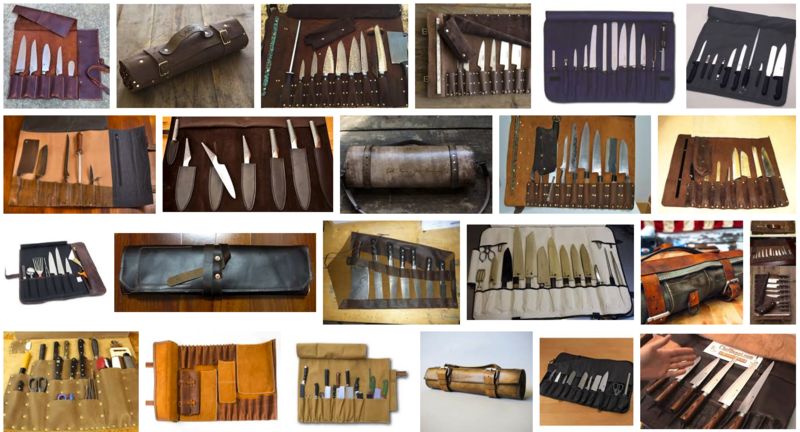 Normally, I’d get in depth with the client, but in this instance, it was a gift—and in any case, he didn’t yet own a knife roll. 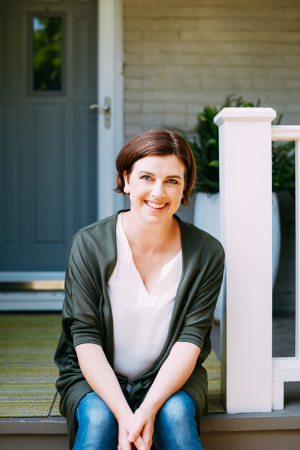 So I turned to Food Director, teacher, TV personality, and author, Claire Tansey, for some sage advice. We met as she was busily preparing for her upcoming book, and chatted about what she liked and disliked about her personal knife roll and her typical loadout for when she’s on the go as an instructor or a television guest. I got lots of valuable insight and advice from her, and I really appreciate the time she took out of her busy schedule. Thanks, Claire! I’m lucky to have you as a great friend. Finally, I spent a lot of time checking out comparable mass-produced products, not only at the beginning but throughout the planning process. There are price points and features I can’t compete with, but also unique value that I can add with a custom handmade approach. I also would add an extra upper accessory slot, making for ten in total. Ultimately, I decided that this would be a classic knife roll—and, because I didn’t want the owner to slice themselves every time they used it—with the blades INSIDE the pockets. Almost all of the commercial rolls I researched seem intended for the handles to be in the pocket. From an economical standpoint, this makes sense—handles are a lot more standardized in size than blade shape, so it’s easier to make a one-size-fits-all design and mass-produce it. It just seemed idiotic from a practical standpoint unless you have separate sheaths/guards/sayas on each blade. Score one for custom made, then, and keeping your fingers intact. With the blade orientation decided, I got my customer to give me measurements of the intended knives and a list of what may be added to the collection in the future. 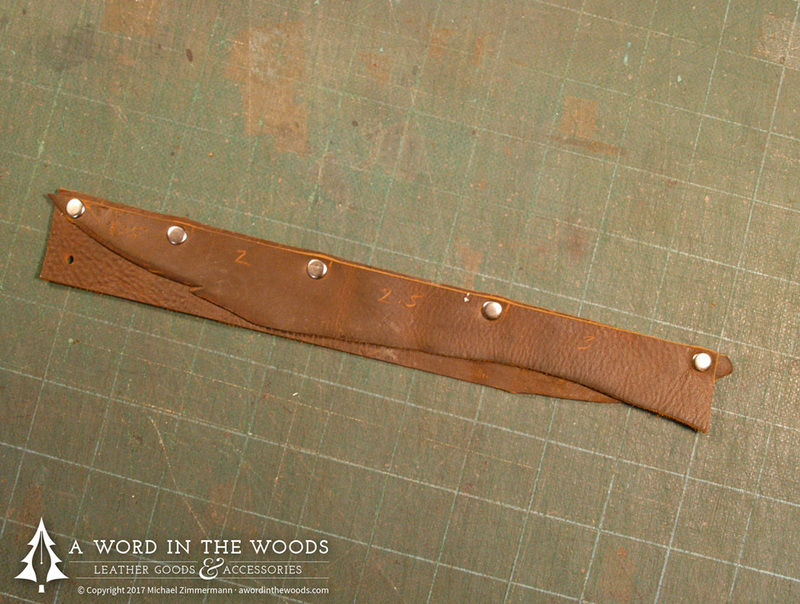 The next step was to makes sure the final blade sleeves would a Goldilocks-worthy, “Just right,” fit. There’s no better way to do this than to actually work with the materials you’ll be using, so I used narrow scraps of the actual leather and rivets of the same dimension to check different spacing options. I compiled a list of the slots and features and started to map out the general layout by scribbling on scraps of paper. 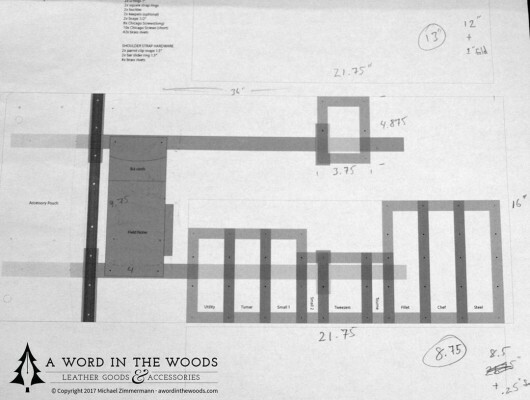 I also employed an old graphic design approach to get a more tangible sense of my layout options and cut out pieces of cardboard to represent every knife. I then made some decisions and tweaks so that not only would this be customized to work with his existing knife collection, there would be room to upgrade or change in the future. I didn’t want it so specialized that it wouldbe useless if he swapped out a key piece. It’s surprising how difficult it can be to place and distribute rivets in a design. I had three different pocket heights, and none divided nicely into another. In order for the knives to be secure, I needed a particular distribution. I could go with evenly-spaced gaps between rivets, or line up key rivets for horizontal consistency, but not both. I find I’m often rewarded aesthetically, even when I’m forced to choose function over form. As an artisan—part artist, part craftsman—I often have to reconcile inspiration, expression, and character with practical requirements. In this case, I think it was starting to turn out nicely. 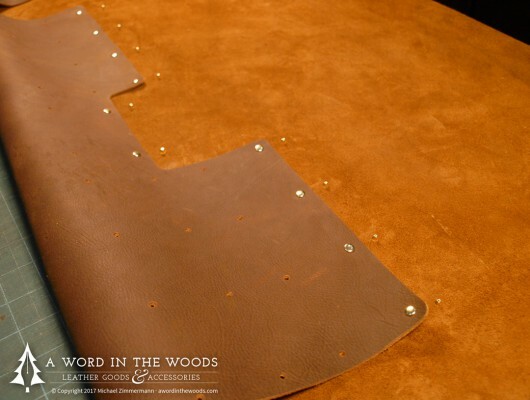 This is the first entry in a 3-part series about the planning and construction of a custom leather chef’s knife roll.